Even though Stationery Stores is not the first football club in Nigeria, it is the oldest among the existing soccer outfits in the country that is lacking in strong sports institutions as most past events are hardly recorded or documented. Stationery Stores, though long passed its glorious days, stands as one of the time-tested football institutions in the country. On Friday February 15, the club clocks 60 years. Coming in as the 1950s were fading out into a new decade that heralded Nigeria’s political independence, the Stationery Stores became a sort of national movement, drawing quality players from near, far and wide as well as being the first privately owned club to win the Challenge Cup and had a support base spread across Nigeria. The late business mogul, Israel Adebayo Ogunyeade Adebajo, founded it. Stationery Stores was the first Nigerian club to feature in the old African Cup of Champions Clubs as well as almost becoming a Nigerian national team, presenting nine of a starting eleven for the country at the Mexico Olympic Games’ football tournament. That is the antecedent of the club that is today struggling to make an impact even within the narrow scope of Lagos football. At the inaugural edition of the new national cup competition, the Aiteo Cup two years ago, there were estimated over 2,000 entries. The oldest of the numerous entries was undoubtedly Stationery Stores Football Club of Lagos, which incidentally, did not make it to the national final stages. By the way, the club’s foundation is remotely connected with the national cup for which Stationery Stores FC was one of the history-makers. The competition is the oldest in the country and had been variously named. At the inception in 1945, it was the Governor’s Cup. Following changes in the Nigerian constitution, the Annual General Meeting of the then NFA on February 28, 1955 adopted the ‘All Nigeria Challenge Cup” as the official title of the competition. The competition transited from the Challenge Cup to the FA Cup and later the Federation Cup before its current name. Before the coming of Stationery Stores, Lagos teams had been dominant in the national cup especially in the era of Governor’s Cup (1945 – 1954) and the Challenge Cup (1955 to 1996). At the time, the big teams were the Marines, Lagos UAC, Pan Bank and Railways. The latter was so domineering that before getting defunct; it won the national cup for a record seven times. It was a record that had remained unsurpassed, even as at 2018. Yet, Railways last won the competition in 1964. So prominent was the club that it was tagged the “Old Reliable”. There was an attempt to form what could be the first quasi-professional football club in Nigeria in 1958, theFederal United. One of the prime movers of the club was Israel Adebajo. The club, captained by Noel Ifedirah who also became an accomplished tennis player, had some sensational results that year going through the tough qualifying series in Lagos. Federal United had an impressive run to the final. At the Lagos zone, it opened its campaign with a 6-2 defeat of Ports Authority which was previously called the Marines and the winners of the maiden edition of the competition in 1945. Next came the ECN, which in the 1960s was to be a great club that won the cup every five years. The rampaging Federal United won 6-3. Federal United also beat WAAC 6-3 before facing Police in the Lagos zonal final. Federal United won 3-2 before having to face Ibadan in the national semi final. Till then, the Ibadan team presented the toughest challenge to the Federal United which is a club built by strong football enthusiasts. The encounter ended 2-2, but Federal United won the replay 5-4. The euphoria of Federal United died in the final of the 1958 Challenge Cup. Against an in-form Port Harcourt team, Federal United slumped badly. Ahead of the final match, their team manager, Lasisi Alatishe was quoted by Daily Service newspaper as saying that the club would ensure that the Challenge Cup did not leave Lagos. It was the 14th edition of the competition and Lagos clubs had won 11 times. “We shall saddle our opponents (Port Harcourt) with our usual heavy goal tally”. He pointed out that Federal United’s matches with Police in the Lagos final and the two matches with Ibadan in the national semi final were severe tests of his players’ abilities. What a paradox it turned out to be! “Slaughter in the sunshine!” screamed the match report in the September 28, 1958 edition of Daily Service. The Federal United club was beaten 6-0 by the visiting Port Harcourt team. The 6-0 score-line in the final remains the widest in the 73 year-history of Nigeria’s national cup up till 2018. Not just that, the dream of the club had been shattered. The founders all went asunder. One of the backers of Federal United was the gentleman, Israel Adebajo, who through hard work and dedication started a thriving business organisation, which had branches all over the country. He reportedly started his stationery business on a modest scale in a small shop in Lagos in the late 1950s, and grew it to the point that the Daily Times in 1969 reported that the Nigeria Office and Stationery Stores (NOSS) had a paid up capital of over £100,000. Stationery Stores players before their 1970 African Cup of Champion Clubs encounter with Ghana’s Kumasi Ashante Kotoko at the Liberty Stadium, Ibadan. Stationery Stores was built on the ashes of another Lagos club that was not popular in the Lagos area. A certain Adewale Adeboye, a Lagos City Council employee, led a delegation to meet Adebajo to take over a Lagos lower division club called Oluwole Philips FC. The late Oyo Orok Oyo, who became the first Nigerian CAF Executive Committee member, corroborated the taking over of Oluwole Philips. Orok Oyo in his column in The Punch newspaper in 1979, wrote that Adebajo took over the Oluwole Philips Football Club that was named after its founder who was a running staff of the Nigerian Railway Corporation, and an elected councillor of the then Lagos Town Council. Oyo further stated that Oluwole Philips Football Club was a Lagos Division III league side in 1958 and was passed on to Mr. Adebajo. Adeboye who made the overtures to Adebajo became the first secretary of the new football club. He later served the defunct National Sports Commission (NSC). Other pioneer officers of the club were: Mr. O Ogunsalu (Welfare Officer), Mr. Ume and Mr. E. Hesse. Some foundation players of the club identified in various publications by their first names include: Goalkeeper Williams, Eddie, Henshaw, Tiamiyu, Anyaiam Jr., Ikediasu, Ake, Adebowale, Onnoyinwi and Banjo. Oyo Orok Oyo who was the General Secretary of the then Nigeria Football Association in the 1960s wrote that in 1961, Stationery Stores was placed under a sound management committee comprising Messrs Peter Osugo, A.A. Adeboye, Bonar Ekanem, Peter ‘Baby’ Anieke (a member of the famous 1949 UK Tourists) who was the coach, Peter ‘Eto’ Amaechina (player/assistant coach), Peju Adebajo, E.T. Lawson, C.A. Adelaja and Mrs. Adunni Adeniji. He added that at all time, Israel Adebajo as the mentor was the patron. According to Oyo, the management remained as it was composed in 1961 until 1970. Within the period, Stationery Stores Football Club won the Lagos Amateur Football Association (LAFA) Division 1 League championship, and the knockout Mulford Cup which later became the Oba Cup in 1964/65; the Challenge Cup for two consecutive seasons in 1967 and 1968 and in 1968, became the first Nigerian club side to take part in the then African Cup of Champions Clubs which is today called CAF Champions League. And yet, those achievements were the product of perseverance and dedication. If instant result or gratification were to be the determinant, Stationery Stores would have been a dead-on-arrival product. In the club’s first major match, a Mulford Memorial Cup competition played on April 23, 1959, Stationery Stores were mauled 7-1 by the old reliable, Railways. According to a Daily Service report of the match, it was even an under-strength Railway team that played as only four regulars were featured. In other climes, that result was enough to put an end to what was an ambitious dream of building a model club that not only the former Lagos Colony and later Federal territory would be proud of, but Nigeria in general. As at the time, Nigeria was playing second fiddle to Ghana in football. Mr. Adebajo reportedly remarked that he was going to put an end to the series of defeats and fears about Ghana by building a model club that will not just conquer in the Nigerian territory, but also create waves along the west coast of Africa. It was not only Railways that made mince meat of Stationery Stores in its infancy in 1959, such bigger and older clubs like the Public Works Department (PWD) also overwhelmed the young club. Later in the year, the club began to recover gradually, especially in the United Service League played by some clubs in Lagos. By July of 1960, the club was already leading in the Commercial League after six matches, winning all. The other clubs of the Commercial League were the Lebanese, NTC, Levers Brothers, Pegasus, Kingsway, Edward Turner, Shell, Gottschalk, among others. They were all business concerns in Lagos, which have football teams and running a separate league in the Nigerian capital city. The league was separate from that of LAFA and the United Services League for government agencies that also had football teams. The club set the pace, which in later years was followed by the sensational Leventis United Football Club of Ibadan, an amalgam of various clubs set up by Leventis Group. Stores rose progressively with yearly promotion from the Lagos division three to one from 1959 to 1961. In its first year as a LAFA Division one club in 1961, Stores only managed to place seventh in a 10-club league. Stationery Stores at the final match of the 1990 Challenge Cup…their last victorious outing at the national cup. It was then that the club mentor felt the urge to get the club’s management reorganised. Peter Osugo, an accomplished newspaper journalist was brought in as team manager to join others in the management cadre of the club. The new management in 1961 drew up a six-year programme to produce what the Team Manager; Peter Osugo called a “model club for Nigeria”. Thus, the club began another ascendancy movement in the LAFA top division. From the modest seventh position of 1961, Stores improved to fifth in the following year. 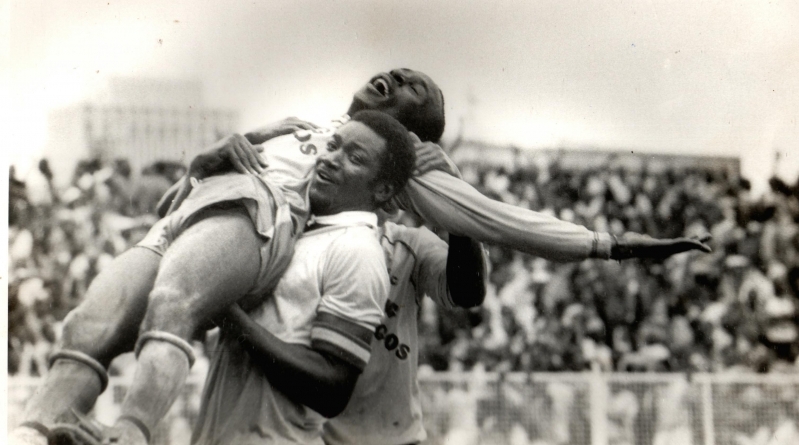 By this time, one of the older players, Peter Amaechina, who in his earlier playing days in Ibadan was called “Eto”, was converted into a player/assistant coach. The alias “Eto” is a Yoruba word for organisation to depict the dexterity with which Amaechina easily took care of the opposing teams. Results started rolling in, even though the top-riding clubs in Lagos, which were a miniature Nigeria, still remained the Lagos Police team, the Lagos UAC and ECN, which won the Challenge Cup in 1960, and was to repeat the feat in 1965 and 1970. But virtually everyone began to notice the potent and emerging force presented by Stationery Stores. By 1964, no one was left in doubt about Stationery Stores which fans tagged the “Flaming Flamingos”, apparently for igniting the various fields of Lagos. That year, the club won the Lagos league championship, thus proudly improving from the seventh position of 1961and the fifth of 1962. Not only that, Stores closed the chapter of the Lagos knockout cup of Mulford Memorial Cup, which had begun as War Memorial Cup in 1942. The competition was instituted as a memorial for the Second World War. It changed to Mulford Cup in 1949 in memory of Baron Frederick Mulford, an Englishman who helped in organising football in Lagos and was one of the key actors in the foundation of the NFA in 1933. Mulford also assisted greatly in the raising of funds for the first Nigerian team tour of the United Kingdom in August 1949. Sadly, he died in Lagos on September 3, 1949, shortly after the arrival of the Nigerian team in the United Kingdom. The following year, the War Memorial Cup was renamed after him. So, when Stationery Stores won the cup in 1964, it was the last time the cup was competed for. The following year, Oba Adeyinka Oyekan, the Oba of Lagos donated another trophy as a replacement. It was called the Oba Cup. So Stores FC closed the chapter of Mulford Memorial Cup and opened the account for the Oba Cup as the first winners in 1965.